The Dutch buckle is specifically designed to replace the marlin spike hitch with a light, faster, and safer method of connecting the whoopie sling to the hammock suspension tree straps. The secret to making this so light weight is all the force is put on the tree straps and not the buckle. 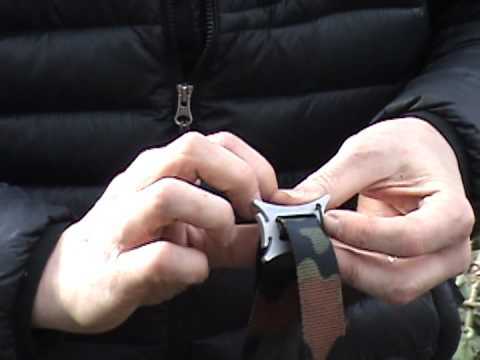 Your Whoopie sling actually be becomes part of the buckle to lock the tree straps in place. With the Whoopie sling going around the tree straps there is much less wear on it and it doesn’t have to make a tight radius. 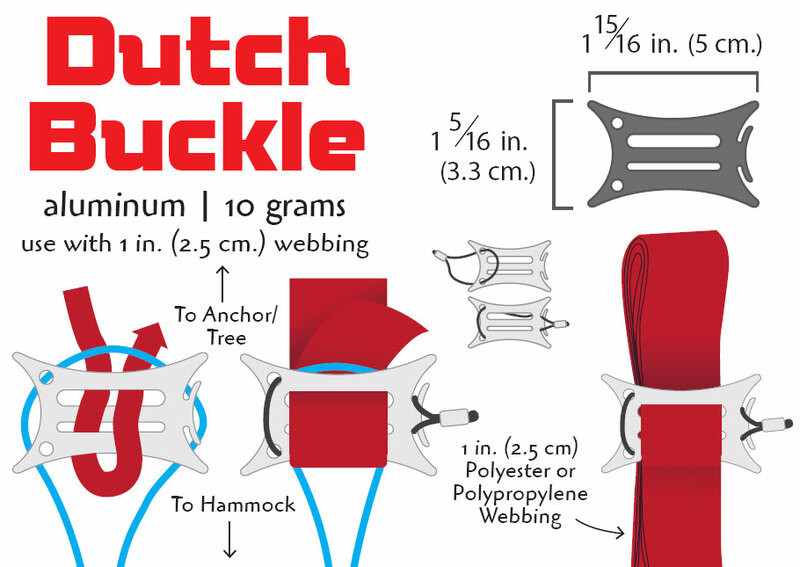 Once on the buckle the whoopie sling can be easily adjusted and won’t slip off the buckle like it slips off the knot of the marlin spike hitch. The buckle is completely adjustable so you can quickly slide the buckle up or down to accommodate a wide variety of tree sizes. 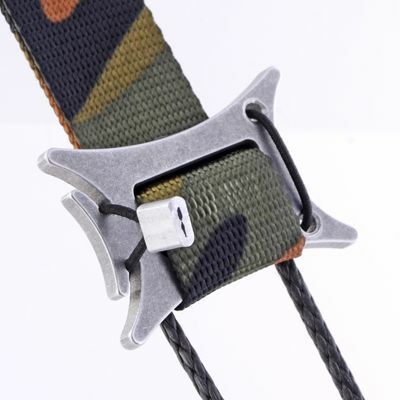 As an added feature the Dutch buckle has a retention shock cord and latch method to keep your tree straps nice and neat when not deployed. This is for the Buckles only, sold in pairs. 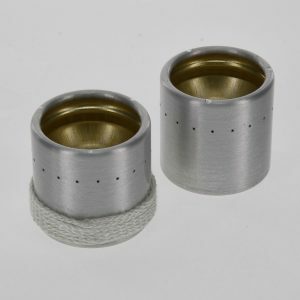 Made to accommodate 1″ webbing. I have the cinch buckles and tried using the Kevlar straps with them and they slipped. 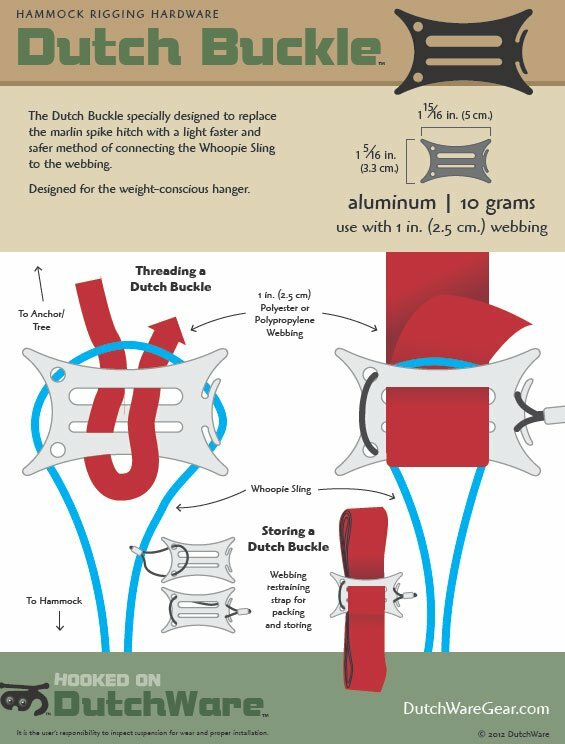 Will using the Dutch buckle solve that problem? 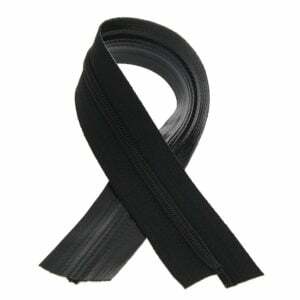 If you take a look at the description of our Kevlar straps we recommend not using kevlar in any buckle style suspension. It does not work well. 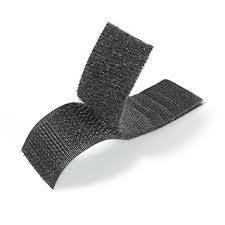 Kevlar straps work best with whoopie sling/toggle suspension or whoopie hook suspension. Is there a weight limit on them? I’m around 300+ pounds. I’ve had mine for a few seasons now and they still look new. I’m 6’2 and weigh 300 pounds. I have about 30 nights in my hammock using these and Dutch’s whoopie slings as my suspension. longest consecutive use was nine nights. I’m 6’2 and weigh 300 pounds. I have about 30 nights in my hammock using these and Dutch’s whoopie slings as my suspension. longest consecutive use was nine nights. I’ve had zero issues with reliability. I bought 2 sets. 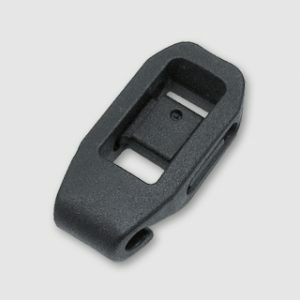 I folded a strap, then fed it through one slot and out the other leaving a loop on one side; as a result, I had a place to attach the ‘Dutch Clip’ without worry of a stitch failing. The other set; I use as designed. 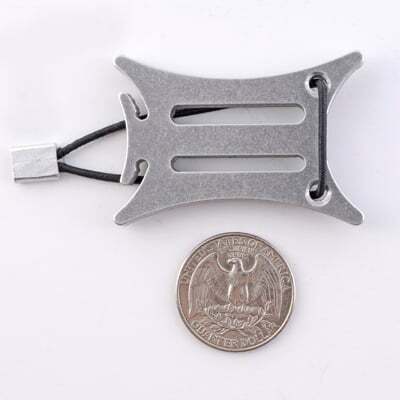 These buckles are very light and feel much more secure than toggles,With the included little cords attached to them it is easy to keep yourstraps wraped up in a very neat little package You will never go back to toggles once you try these ! 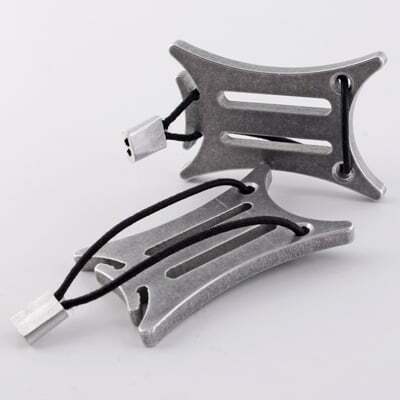 I recently bought a set of these dutch buckles and have used them a few times in my yard and most recently on a two day camping trip to a state park. There is no slip on these at all and I am 245lbs, lightweight and super strong I was very impressed. I especially love the elastic “keeper cord” that allows me to bundle these up secure them off the ground. My only complaint, and it is minor is that they are a little hard to slide the Dyneema straps through, but at the same time you don’t get any slippage either. 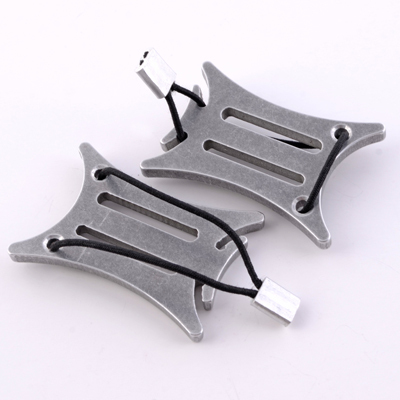 Would these work well with the new Spider Web 2.0 straps? No these will not work well with the Spider Web 2.0 straps. I would recommend the Dyneema/Poly tree straps or the Polyester tree straps.